Imagine a place where you can retreat to and really relax in. A place that adds light and air into your home. A place just for you - tailored to your needs and individual style. Conservatories add more than just extra space. Conservatories give more than added property value. Conservatories bring light and energy into your life and transform the place you call home. From the elaborate to the contemporary, Pinefield Glass Conservatories deliver highest quality engineering and exceptional value for money. 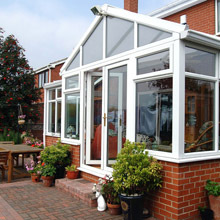 An extensive range of styles enables the right character of conservatory to be chosen to suit most homes. Plus, our coveted reputation for quality and reliability gives you confidence that you are making the right choice. What better way to enjoy long summer days and cosy winter evenings than from the relaxing retreat of your stylish conservatory? Pinefield Glass are manufacturing specialists, in providing the complete conservatory, bringing customers greater choice, higher quality and more value for money. Lean-to; P-shape and elaborate lantern and orangery designs. Whether you want Georgian bars, vertical sliding sash windows, stained or leaded glazing, we can create the look that's right for you. Design engineered with minimum reliance on sealant � with some conservatories, large amounts of silicone sealants are needed to ensure water-tightness. This can be ineffective and unsightly.Our roof system is one of the most advanced conservatory roof systems currently available, reliance on on-site sealants is minimised. The result is a design-engineered conservatory with life-long, watertight performance. Unrivalled product range, expertise and service network partner. Brochures for Contemporary Conservatory Concepts and The Conservatory Collection.